Here is the photo I used for reference; taken many years ago with my SLR camera. 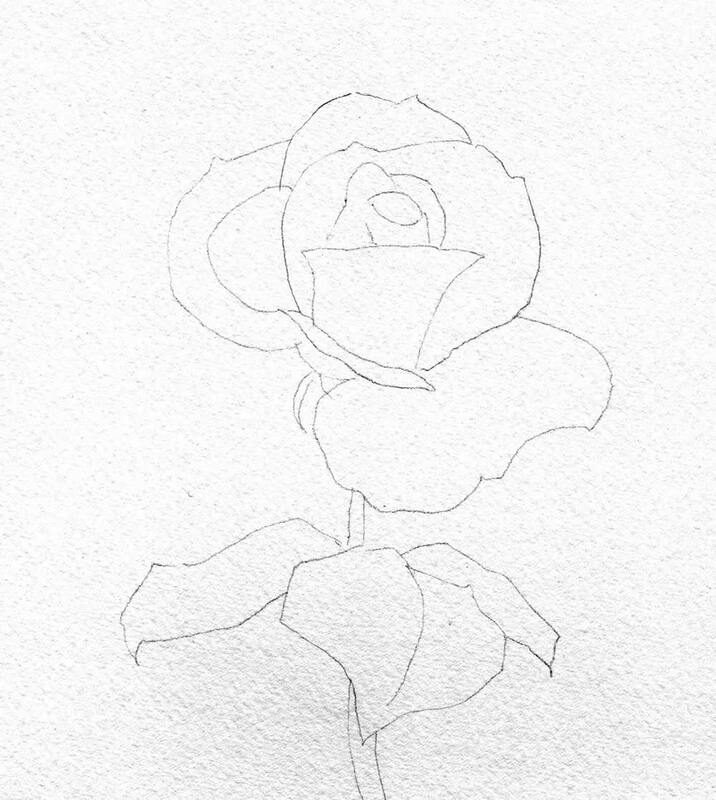 I did a quick, pencil drawing of the rose on watercolor paper. 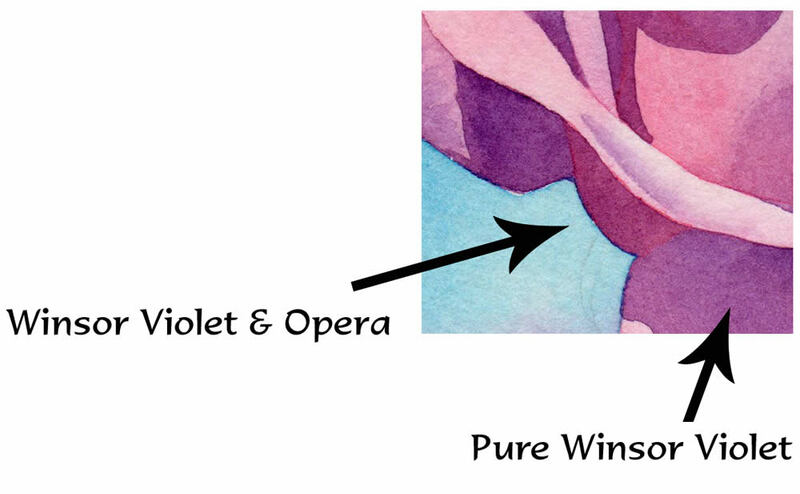 Each petal of the rose is painted separately using Permanent Rose, Opera, Winsor Violet, and Cobalt Blue. 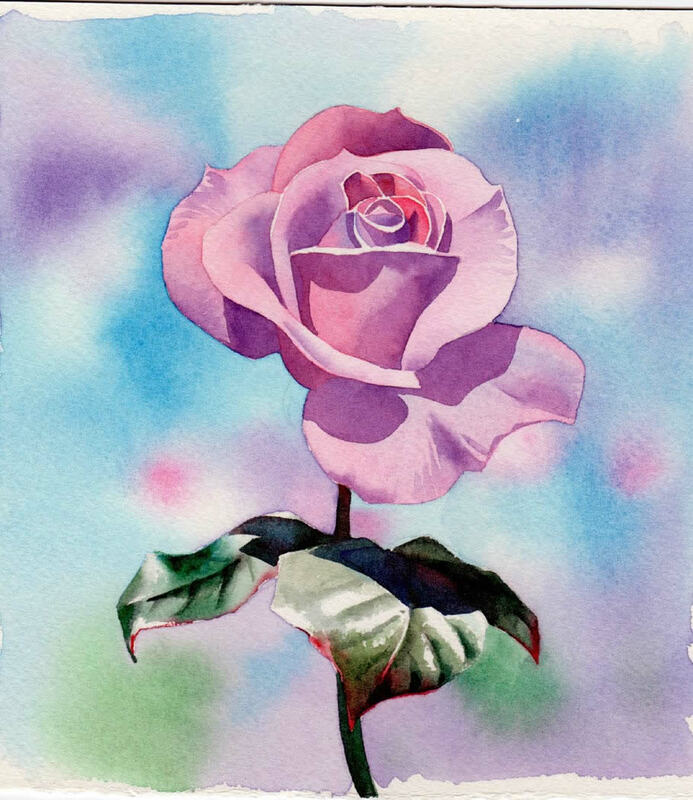 Remember to paint every other petal, so the paint washes won’t run into each other. A. I wet the area of the petal with plain water, then add pure colors, letting the water do the mixing. B. I painted the petal with Permanent Rose, then immediately added a little Cobalt Blue along the top edge while the paint was still wet. 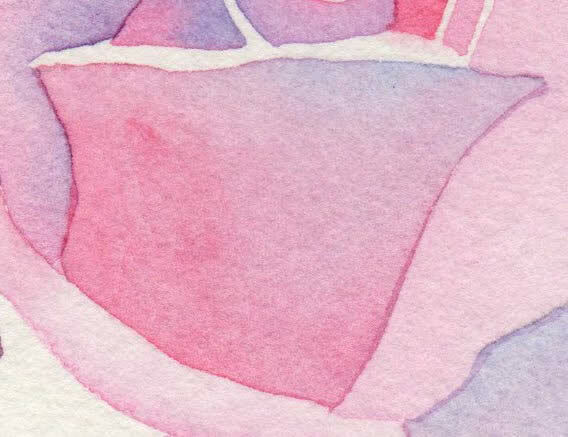 I painted the background using technique A., getting the paper very wet, adding the color, then tipping the paper to let the colors flow together. I don’t try to paint the whole background at once. Here you can see that I painted the background in 2 sittings. This is the big advantage to doing a splotchy, washy background. The leaves are painted with Sap Green, Viridian, Peacock Blue, and Alizarin Crimson. Plus, I mixed Alizarin Crimson and Viridian to get a black. 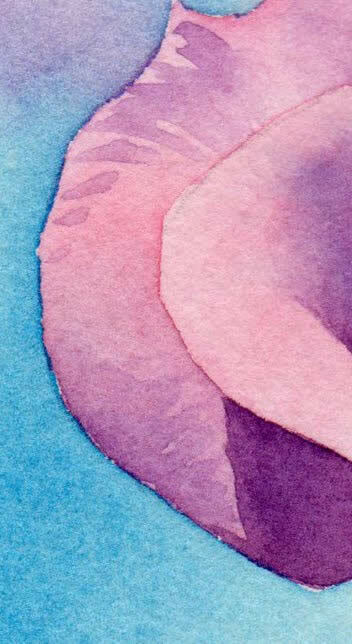 The cast shadows are added to the flower petals, using Winsor Violet with a bit of Opera here and there. Remember to paint every area separately, so the colors don’t bleed. Cast Shadows on the leaves are Black, Viridian, and Prussian Blue. Suddenly the rose has dimension! I also added some detail texture to some of the petals, but that is done after the shadows are completely dry. 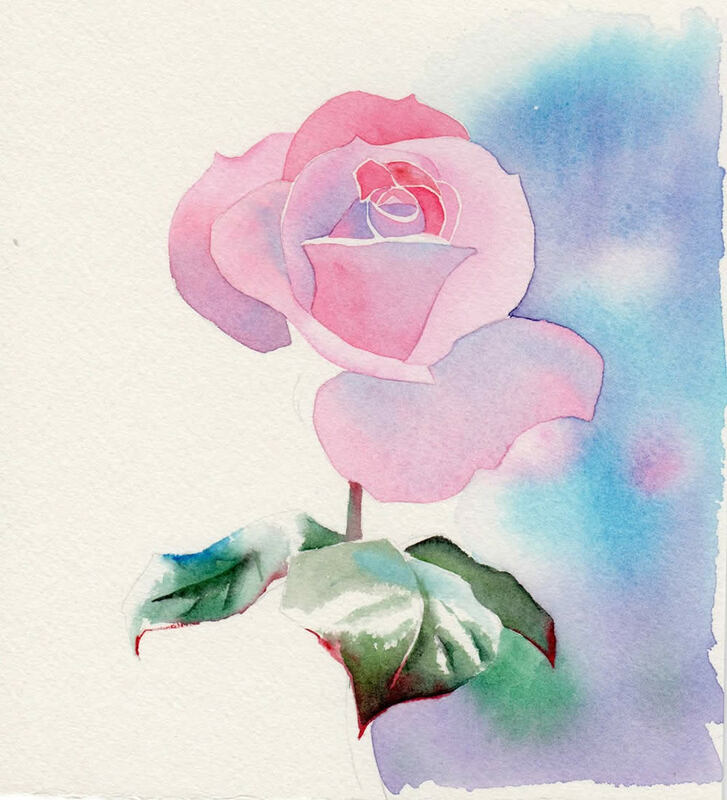 I added another layer of pink color over the rose, using Opera and Permanent Rose. Again, painting each petal separately. The last layer of pink wash was not painted in a flat manner. I tried to follow the gradations of light and dark I saw on the photograph. I also didn’t paint the edge of the petal with the second layer. This gives the flower more shape and dimension. I added a very dark wash to the background using Viridian, Peacock Blue, Winsor Violet, and Prussian Blue, with a few dabs of Opera, and some black (Alizarin Crimson and Viridian) lines added to the wet wash to give the impression of foliage. I washed water over each leaf. This “melted” a bit of the heavy pigment and diminished the contrast a little. Too much contrast draws attention, and I don’t want the leaves to be the center of interest in this painting. 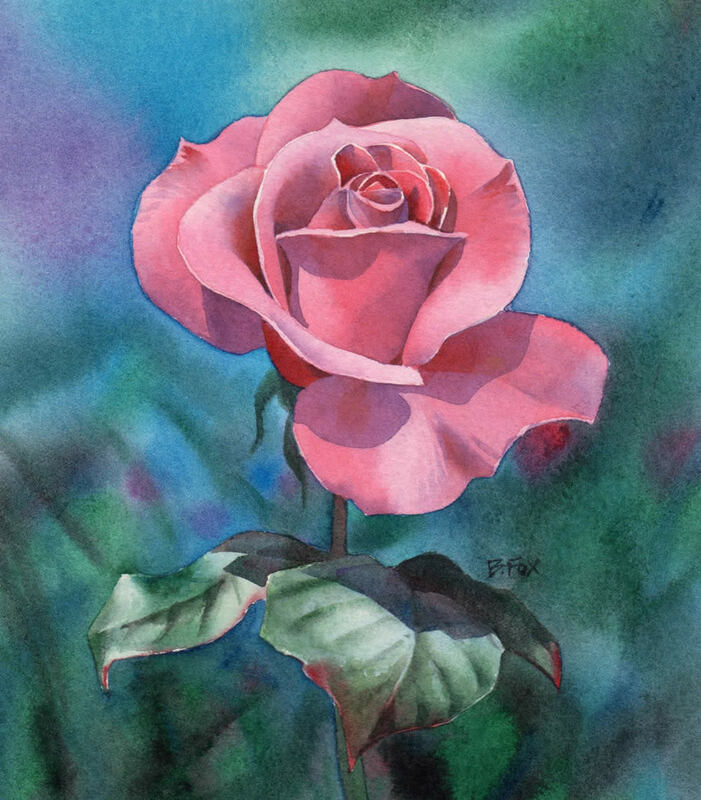 The pinks and cool blues and greens balance each other very well in this painting. 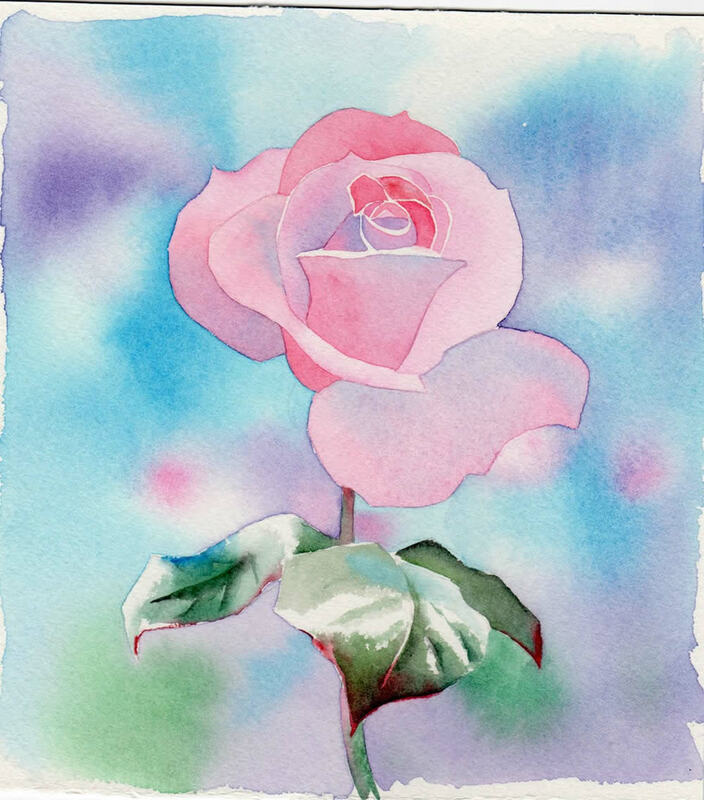 The painting as a whole is quite dark, but the vibrant pink color, and the value contrast of the rose make it the center of attention. Lines around the subject -you get this very subtle effect when each area is painted seperately. Complementary colors – The pink flower against the greenish background. If something is inclear in this demonstration, please let me know by leaving a comment or sending an email. Perfect color! 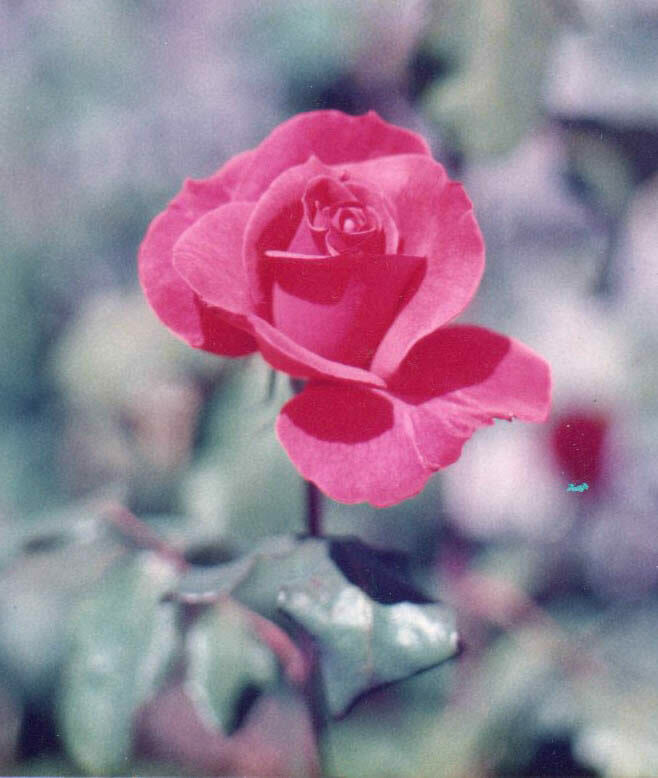 It’s much more than the color of the original flower in your photo. You have an amazing hands, how I wish I can also have a talent when it comes to color combination. Keep that talent and treasure it, that’s a gift given to you. This is a beautiful painting. 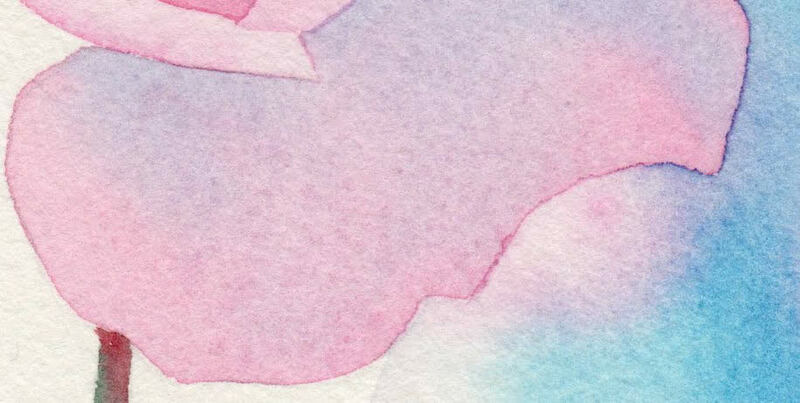 I love all mediums that are done well, but watercolour is so fresh and pure. This artist handles it very well. great finishing.really beautiful than the original one.very good finishing and color combination.